If you're using AdBlock or Adblock Plus but are having issues signing up for a free trial of iHeartRadio Plus or iHeartRadio All Access on iHeart.com, we recommend disabling it while on iHeart.com. This will allow you to continue to use AdBlock or Adblock Plus without the need to manually disable the extension when using the iHeartRadio website. To see a guide on how to disable AdBlock or Adblock Plus for iHeart.com, click on your browser below. 2. After the drop down list appears, click on the button that says "Don't run on pages on this domain"
3. 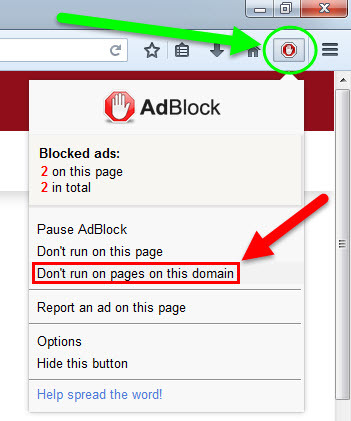 After a pop-up box appears titled "Don't run AdBlock on...", click on the button that says "Exclude"
2. Click on the button that says "Enabled on this site"
3. 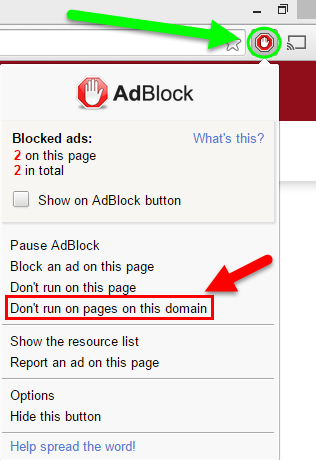 After a pop-up box appears titled "Don't run AdBlock on...", toggle the slider to the right and click on "Exclude"
2. 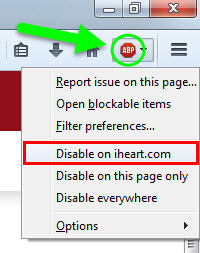 Click on the button that says "Disable on iheart.com"
Clear the checkmark next to AdBlock in the Preferences window. 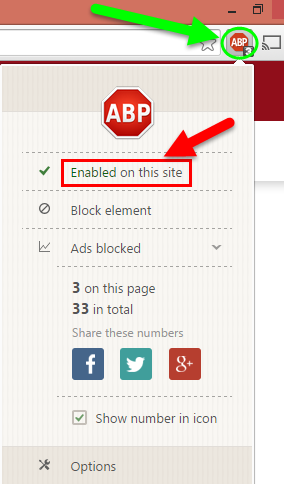 AdBlock will then be temporarily disabled, until you decide you want the extension re-enabled. If you don't see the icons on any of the browsers above check the installed Extensions in your browser to see if Adblock or Adblock Plus is installed. If you don't see Adblock or Adblock Plus but are still having trouble streaming try our other troubleshooting steps.